Why Therapeutic Yoga? What does movement and exercise have to do with it? I have been interested in movement forms, dance and exercise as long as I can remember. I began leading group exercise and stretching in high school and continued to do so throughout my college years. I was not a “typical” Physical Therapy major. During my college years I was fortunate to be able to continue to feed my love of movement by taking classical ballet technique, modern, tap and improvisational movement while also taking a full course load of anatomy, physiology, neurology, and PT course work. I was able to expand my passion for performance in theatre and art classes as well as immersing myself in computer courses. I didn’t know it then, but these experiences were preparing me for my role as a future physical therapist that eventually would move out of traditional practice expanding into non-traditional work with mind body spirit practices and then putting all those things together in running my first yoga studio. 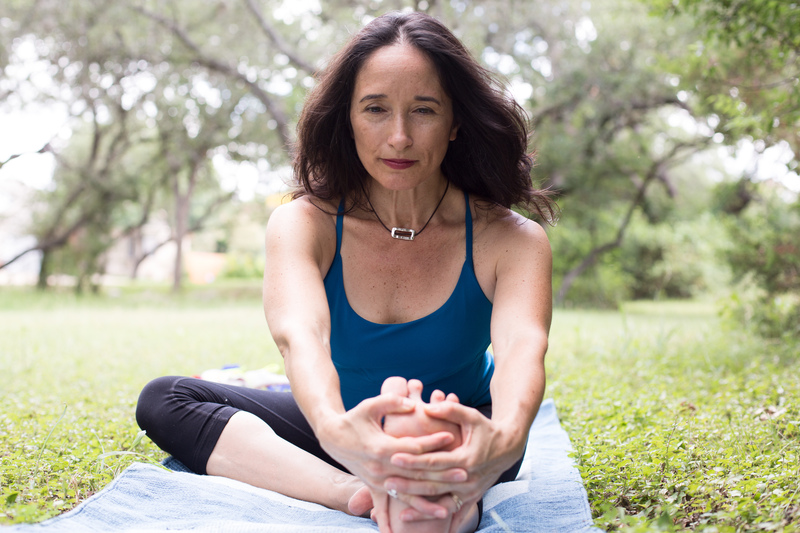 What is Nydia's Yoga Therapy? Nydia’s Yoga Therapy is a unique practice and lifestyle approach that melds fitness and neuromuscular rehabilitation with western physical therapy and traditional eastern Hatha yoga practices. This practice addresses the “whole” person and focuses on acknowledging each individuals unique history and abilities. This focus helps individuals be at peace if and when they recognize limitations as they present themselves. This practice is effective in helping to reduce the suffering of those who experience acute and/or chronic pain and empowering those individuals who want to avoid suffering future orthopedic or neuromuscular challenges. This practice is directed towards helping individuals improve their physical function to positively affect their quality of living. This practice aims to teach those who are willing to learn— as much as they care to know about their physical bodies. To help reduce the fear of the unknown and to empower them to make informed choices about the care of their most precious possession—their whole health. I present this practice to the community via Nydia’s Yoga Therapy studio in San Antonio, Texas. The studio’s presence allows me to act as an ambassador for yoga in the San Antonio medical community and facilitates the continuing education of the general community and its community of medical and yoga professionals . I am able to dispel misconceptions about yoga and promote safe and effective yoga instruction and practices that emphasize breath centered awareness, functional mobility and stability, use of proper technique and balanced spinal/joint alignment modified to meet the needs of the individual whether they practice alone or in a group setting. The studio presence also allows me to mentor and train my team of yoga instructors and participate in yoga research so that the healing and transformational approach that is Nydia’s Yoga Therapy can positively impact as many lives as possible. Leaving the Serenity Studio on Lockhill Selma to create the new Serenidad Studio. I heard these words during an interview of one of my favorite musical artists and they resonated strongly with me, supporting my desire to create the Serenidad Studio. In the 10 years that I have been working within the Serenity Studio on Lockhill Selma road, I have always struggled with the challenges that come with having two homes. My real home housed my husband, children and self. My yoga studio home supported my passion, creativity, research and yoga family. I am a “home body” by nature… so every day, I faced the experience of being ripped out of the comfort of my real home to go to my studio home, settling in for the day, only to be ripped away from the comforts there at the end of the day. The Serenidad Studio began to take shape in my mind within one year of opening the Serenity Studio at the Lockhill Selma location. 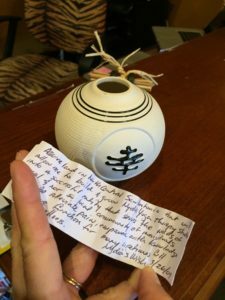 In 2009, one of our beautiful yogis gifted me with this ceramic wishing pot. Micha and I recently found it up high on a shelf at Nydia’s Yoga Therapy Studio. I remembered what it was, but could not remember if I had put it to use. The photo that you see represents the intention that I set about a year into having opened our current Yoga Studio location…by the time 2009 rolled around I already knew what I wanted to do. Now I just needed some time and a whole lot of blessings. Here are the words on the sheet of paper that I wrote in March of 2009. If you have been at the studio and have heard me say… “Set your intention to create your reality.” You will know that I am not kidding! This is evidence that our intentions are POWERFUL! Be mindful what you think… and be very honorable and specific in your intentions. Nydia's Yoga Therapy... a dream becomes reality. 2006, i was preparing to open my studio in San Antonio… trying to figure out what to call this thing that I had been offering in private sessions and in small groups since the mid ’90s…integrating the yoga lifestyle, breathing and movement practices into the offerings that i provided my clients to help them care for themselves (for the long term)… and so NYDIA’S YOGA THERAPY STUDIO was born…and the tag line followed soon after. And now the next chapter of this adventure begins. 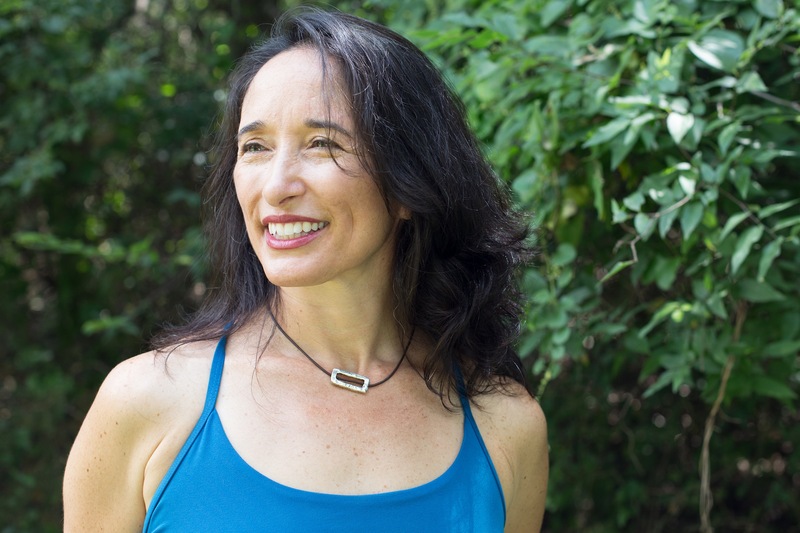 What inspired the creation of Nydia's Yoga Therapy Studio? Nydia’s Yoga Therapy is a process that began to define itself in the mid 90’s when I began reading about yoga movement and lifestyle practices. My own personal experience with movement in the form of traditional exercise, dance and physical therapy melded exquisitely with the ideas that I was studying. This helped me incorporate Yoga lifestyle and movement practices into my existing personal fitness and health regimens. Over time, the work that I was doing with my private therapeutic and fitness clients was being positively influenced by the subtle meditative practices that I had developed. This new work involved the melding of gentle diaphragmatic breathing with subtle core work to encourage an improved awareness and use of neutral spinal alignment during functional activities that improved my client’s mobility and stability. As we neared the new millennium, I knew that this method had such great potential to help so many people improve their overall mind/body/spirit wellness. There was no turning back. When and why did Nydia start practicing yoga. In my 20’s I was very physically active, teaching hi-impact exercise, weight training, roller blading, cycling—you name it. Many of the mature clients that I had been working with in physical therapy and fitness helped me to realize that I should look for a way to maintain my strength, mobility and endurance with activities that I can do during my entire lifetime. In the ‘90s I began reading and studying many different forms of movement and exercise and when I started yoga it just made sense to me. It met all of my needs. I had no idea just how much the yoga lifestyle practices were going to positively influence my work and life. I am so thankful for these practices. As I mentioned earlier, I began reading about and studying yoga movement and lifestyle practices in the mid ‘90s. There were not as many resources then as there are now, so I just found as many books as I could and read them for my own personal information. I had no intention of ever teaching yoga. After about a year of reading, I put one of the books down and started to do the physical practices, what is known as Hatha Yoga. Movement and exercise are things that I had been very familiar with and so I just began to follow the instructions and or photos that were offered for postures. I did notice that many of the traditional Hatha Yoga postures were difficult to do, so I began modifying them in order so that I could be successful. In reality, I broke down each posture that I wanted to do (into its basic elements) and then I began to build the posture back using my body in a step by step method so that I could safely perform “my own version” of each posture. These days, I help individuals come to their own personalized method of yoga practices doing much the same thing…breaking it down before building it back together. Some of Nydia's biggest influencers for inspiring yoga teaching and practice. I have had many teachers in my life. My parents actually lived a very yogic lifestyle in the way that they supported so many individuals who were in need and raised my brothers and sisters to be optimistic, hard working and grateful individuals with servant’s hearts. My older siblings have been amazing teachers and I am forever grateful for their patience with me. My life and teaching have been influenced strongly by the 8 Limbed Path of Yoga that has been described by the Sage Patanjali in the ancient writings of the Yoga Sutras. I am encouraged that the writings reflect the similarities between many cultures in their efforts to live with a servant’s heart helping others to improve themselves and their actions towards others. I have truly learned something from very person who has ever allowed me the privilege of working with them in fitness, physical therapy, or therapeutic yoga over the last 35 years. I am forever grateful for their presence in my life. Favorite place to teach yoga in San Antonio. These days I recognize that there are many forms of meditation. Looking back to the time when I didn’t tolerate reading about meditation, I realize that I was actually practicing a form of movement and breath centered meditation when I went for my regular run outdoors with my dogs. These days, my meditation practices vary in style, length and duration, but I have experienced the great benefits of meditation and wholly encourage others to begin their journeys. The therapeutic breath centered yoga movement practices that I have developed over the last 35 years are actually a form of movement meditation that can help individuals begin their journey with success. What Nydia would tell a beginning yogi / yogini. That the only thing that they REALLY have to do is BREATHE during their daily lives and regular yoga practices. The rest will come with effort, consistency and determination. AND, that “Muscles may get tired, but joints should NEVER hurt” when we practice yoga movements. What style of yoga practice does Nydia recommend to beginners. I recommend the breath centered modified Hatha Yoga movement practices that I have developed over the last 35 years. I am a Doctor of Physical Therapy and am fortunate to have many choices in determining how I will provide therapeutic services to the community of individuals in San Antonio. I have chosen to share gentle breath centered therapeutic yoga lifestyle and movement practices because they can benefit so many people in so many ways. Vision for Nydia's Yoga Therapy Studio and yoga in San Antonio. My vision is to teach as many individuals how to take care of their most precious possession during this lifetime…. their combined physical, mental and spiritual HEALTH. I intend to do this by continuing to offer community classes and to expand upon the training of current and future yoga teachers with latest division of my therapeutic endeavors–the Open Hand Institute (www.OpenHandInstitute.com), in order to eventually create a positive global impact. I want to empower as many yoga teachers to be more effective in their instruction and awareness of modifying and making accessible the yoga lifestyle practices that I will share with them.